Remember our Quick & Easy Cashew Basil Cheese from last week? 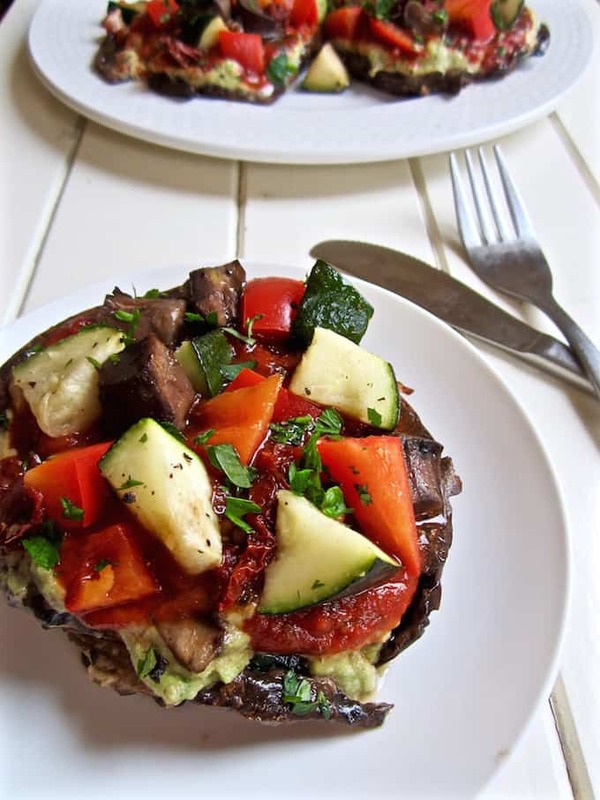 I hope you made a double batch because you’re going to want it on these yummy Portobello Pizzas! Portobello mushrooms = delicious. Pizza = delicious. Pizza + portobello mushrooms = extra delicious! Portobello mushrooms are one of my favorite vegetables (ok, technically they’re fungi, not vegetables, buuuut how appetizing is it to say you’re eating fungus?). They’re hearty, ‘meaty’ and nutritionally dense. They are enjoyable mixed in casseroles, stir fries or salads, while also being worthy of the solo spotlight when simply grilled, broiled, baked or stuffed. In this recipe, they make a great base for ‘pizza’. Now, you be thinking, “But pizza needs a doughy crust!” (Or is that just my husband Geoff who says that? For the record, he really enjoys these, but in his mind not much can beat one of his favorite foods ever – pizza.) So from that perspective, this isn’t exactly ‘pizza’ in a traditional sense where you could fool someone that they’re actually eating pizza. 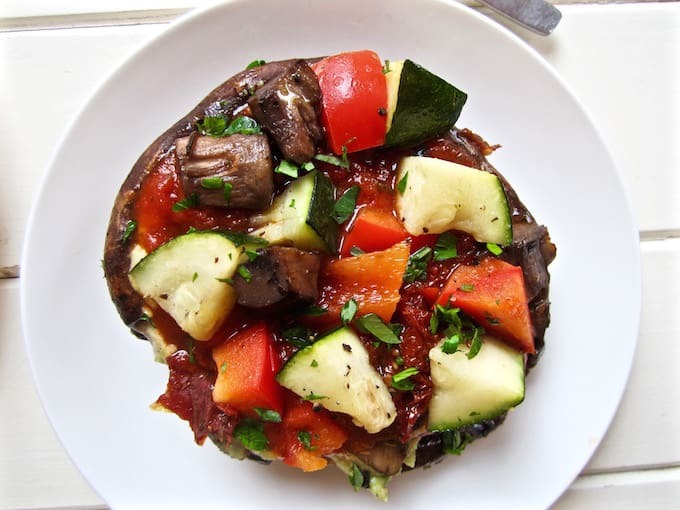 HOWEVER, it has a similar flavor profile to pizza, is super easy, healthy, veggie packed with lower carbs and calories – and of course, delicious! (Or it wouldn’t be on this blog.) So to me, it’s a perfect plant-based swap when you’re wanting to lighten up pizza or desiring a change of pace. 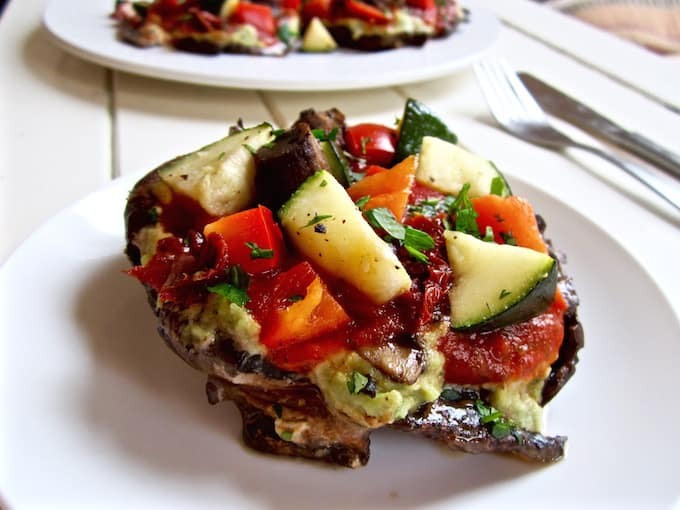 My topping suggestions in the recipe are what I used when I last made these, but I’ve been making portobello pizzas for awhile now and just use whatever vegetables I have on hand. You can also use store-bought vegan cheese instead of the cashew cheese, or no cheese at all and just sprinkle nutritional yeast on your pizzas before eating. 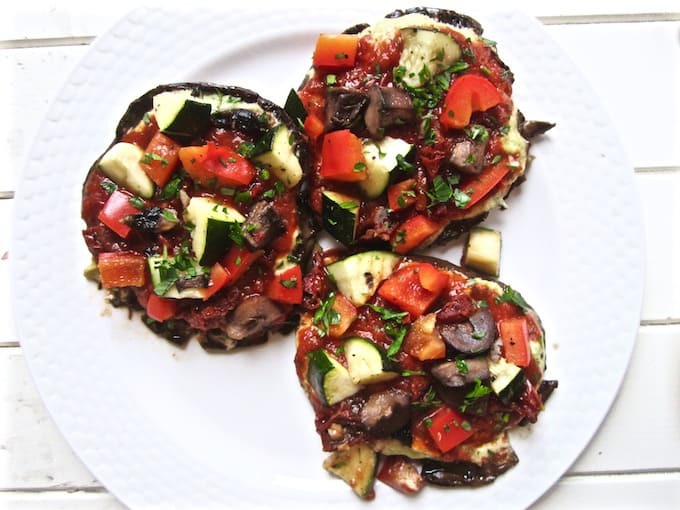 Each mushroom has about 3 grams of protein (depending on the size of the mushroom of course), so eat a couple of these mushroom pizzas, throw on some hemp seeds or white beans on top or serve it with quinoa, and you’ve got yourself covered for protein. How do you like your #portobellopizzas? Tag me on Instagram to share your creations! Pizza + portobello mushrooms = extra delicious! Vegan, gluten free, easy and healthy. A perfect plant-based swap when you’re wanting to lighten up pizza. Wipe the mushrooms clean and remove the stems. Mix all marinade ingredients together and drizzle on top of the mushrooms, stirring to evenly distribute. Ideally let sit at least 15 - 30 minutes for maximum flavor, stirring halfway through. If you’re in a rush, you can cook right away. 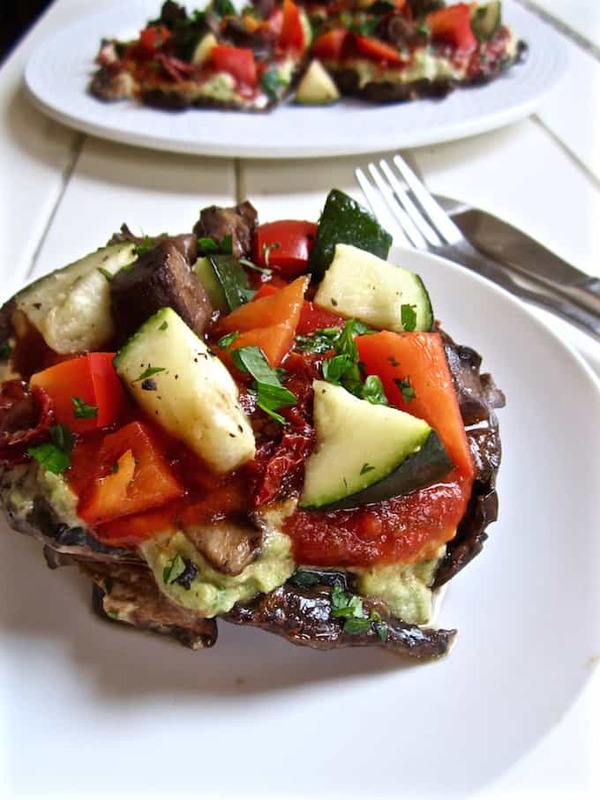 Dice the mushroom stems and combine with the red pepper, sun dried tomatoes and zucchini in a bowl. Drizzle with just a touch of olive oil (about 1/2 tsp) and a sprinkle of salt and pepper. Stir to combine. Preheat the oven to 375 degrees F. Assemble your pizzas by layering about 1 - 2 Tbsp of marinara sauce in the bottom of the mushroom, then 1 - 2 Tbsp of cheese (or cheese on the bottom and then marinara sauce), then your fresh veggies. Careful not to make them TOO sloppy by adding too much of the sauce or cheese - you want the mushrooms to keep their structure and not be overly cooked or soggy. Bake in the oven for 15 - 20 minutes. While cooking, chop your fresh herbs of choice, and add to the top when the pizzas are ready. *You can also use store-bought vegan cheese, or no cheese at all and just sprinkle nutritional yeast on your pizzas before eating.